Iranian Foreign Minister Mohammad Javad Zarif and Ecuadorian President Rafael Correa held talks at a meeting in the South American country’s capital, Quito. In the meeting, held on Wednesday, the two officials explored avenues for expanding economic relations between Iran and Ecuador in oil and energy industry, banking services, shipping industry and agriculture. They also discussed mutual cooperation at the regional and international levels. 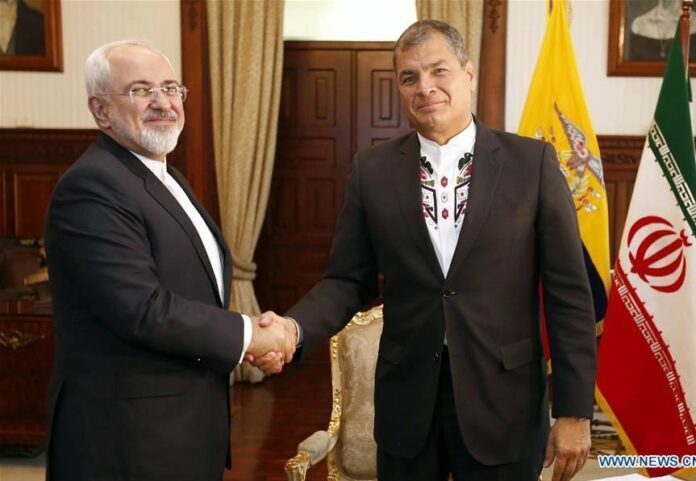 Heading a 120-strong delegation of Iranian business people and economic officials, Zarif arrived in Ecuador on Wednesday in the third leg of his six-nation tour of Latin America, after visiting Cuba and Nicaragua. Zarif and his entourage left Ecuador to Chile early Thursday, and are scheduled to visit Bolivia and Venezuela afterwards. Iran’s Foreign Ministry has said the tour of Latin America signifies Tehran’s plans to boost non-oil exports.